Last month, actress Anna Kendrick revealed in an interview that her brother sent her a Squirrel Girl comic, because he thinks she should play this Marvel character in a movie. Of course, Marvel has not announced any plans to make a Squirrel Girl movie, but Avengers: Infinity War director Joe Russo teased that some of the Great Lakes Avengers could appear in Spider-Man: Homecoming, which is currently filming in Atlanta. 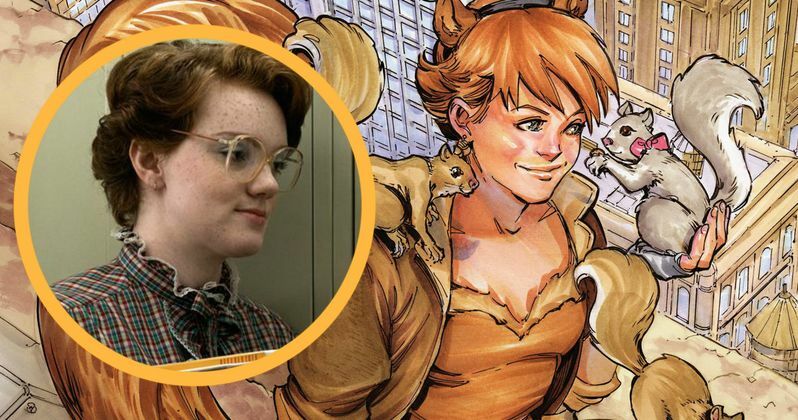 Since Squirrel Girl was part of the Great Lakes Avengers, it's possible that this character could surface in Spider-Man: Homecoming, and now it seems there is a new candidate for the role, Stranger Things breakout star Shannon Purser. Ironically, 19-year-old Shannon Purser, who made her acting debut on Netflix's hit series Stranger Things as Barb, the best friend of Natalia Dyer's Nancy Wheeler, is a native of Atlanta, where Spider-Man: Homecoming is currently shooting. Earlier this week, the actress stated on Twitter, "So who do I talk to about being Squirrel Girl?" She also revealed that she has been a "big Marvel fans since forever." Again, there is no official indication that Marvel is developing a Squirrel Girl movie, or that she will have a presence in Spider-Man: Homecoming. As for Joe Russo's Great Lakes Avengers hint, that could be in reference to any number of characters, such as Mr. Immortal, Dinah Soar, Big Bertha, Flatman, Doorman, Monkey Joe, Tippy Toe, Grasshopper and Gravity. At one point, Deadpool was even part of the Great Lakes Avengers, which is headquartered in Milwaukee, Wisconsin. Squirrel Girl, a.k.a. Doreen Green, made her comic book debut in Marvel Super-Heroes vol. 2, #8, a.k.a. Marvel Super-Heroes Winter Special in January 1992. She was created by Will Murray and drawn by Steve Ditko, and has the ability to communicate with squirrels, along with superhuman agility, senses, and strength, razor-sharp claws and a retractable knuckle spike. Doreen was 14 years old when she first appeared in the comics, ambushing Iron Man in the woods in an effort to try and impress him and become his sidekick. Shannon Purser appeared in five episodes of Stranger Things during the first season. It isn't known if the actress has any other projects she's considering after her breakout role in Stranger Things, but it seems clear that the actress would love to star in a superhero movie. Take a look at Shannon Purser's tweets below, and let us know what you think about this actress playing Squirrel Girl.